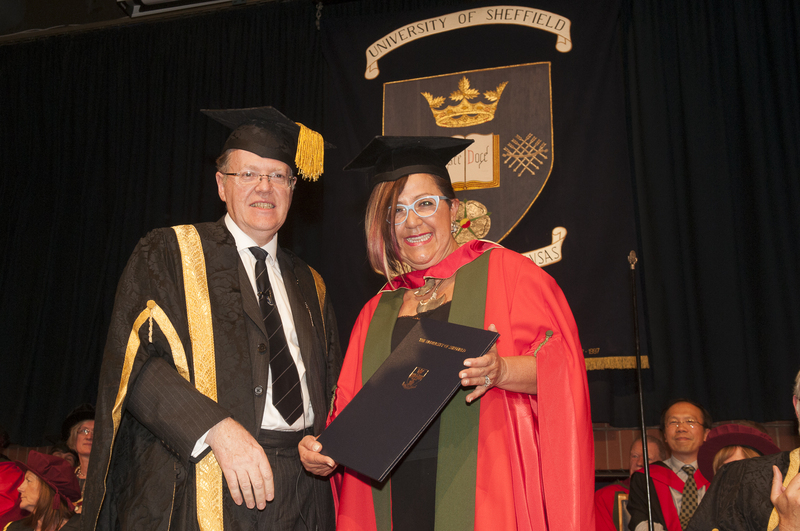 IFLA past president, Martha C. Fajardo received her honorary Degree from Professor Sir Keith Burnett, Vice-Chancellor of the University of Sheffield. Dr. Fajardo an alumna of the University of Sheffield, gained the Diploma in Landscape Architecture in 1981. She was attracted to the first independent Department of Landscape Architecture, based in Sheffield, due to the reputation of Professor Arnold Weddle. Professor Weddle was appointed in 1967 and quickly built an international reputation for the new Department as a true centre of excellence. E.g. he established one of the most important academic journals in the field, Landscape and Urban Planning (Elsevier). On returning to Columbia and entering practice, Dr. Fajardo founded the Colombian Society of Landscape Architects, through that she became active in the councils of the International Federation of Landscape Architects (IFLA). In 2002 she was elected President of IFLA and served with great distinction until 2006. During her term in office she greatly strengthened the effectiveness and international scope of this organisation so that it now has membership from almost 70 countries. She also pioneered an initiative for the development of landscape architecture in Africa and successfully brought to a conclusion the long-running negotiations that enabled the fast-growing Chinese profession to join IFLA. Her contribution and her international reputation is summed up by this quote from Professor Kongjian Yu from Peking and Harvard Universities: “During her time as IFLA President Martha radically changed the face of the global Landscape Architecture community……if I were to ask young Chinese students who has been the most influential amongst all the international landscape architects of our time. Martha Fajardo would no doubt be listed as one of them” . Since completing her term of office Dr.Fajardo has continued to work tirelessly on both the Colombian and the international stage – driving forward an initiative to establish, under UN auspices, an International Convention on Landscape, helping to establish the first Masters Degree in Landscape Design in Colombia and with her project on the first Green Plan in Colombia leading to the establishment of the Coffee Cultural Landscape of Colombia, a designated UNESCO World Heritage site since 2012. For more information please visit: http://www.shef.ac.uk/landscape/newsfeed.